The Federal Ministry of Power, Works and Housing on Wednesday opened a section of the IJora/Apapa Bridge, which was closed to traffic for repairs in July. 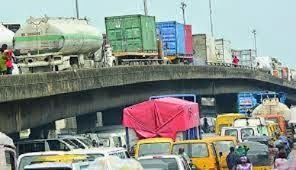 Also known as Leventis Bridge, the highway, which is a major exit point from Apapa Wharf, was shut following a fire incident that affected its reliability. While re-opening the facility to traffic, the Director, Highway Service, South West, Mr. Funsho Adebiyi, said the action would assist in taking trucks off the road and ease traffic flow around the port. He thanked Lagosians and drivers for their patience and cooperation while the exercise lasted. Assuring them of government’s commitment to ensuring that roads within Apapa axis were in good shape to ease businesses in the area, he, however, warned that security agencies would begin the evacuation of miscreants and illegal occupants of the bridge to prevent another inferno. Federal Controller of Works in Lagos, Mr. Adedamola Kuti, said all the expansion joints on the bridge were bad, adding that some other deteriorated portions made it unsafe, hence its closure for repairs by Julius Berger. To further tackle the traffic menace at the port, Adebiyi promised that the Tincan Trailer Park, the main parking facility with supporting amenities, including a police post, convenience and an office building (to be used by the Nigeria Ports Authority) is ready. He disclosed that the entire work, including the shoreline protection, would be done within the next three months. Confirming the development, the contractor, Mr. Gianfranco Albertazzi, said that most of the materials needed for completion of the shoreline were already at the port awaiting clearance. The contractor assured that, when completed, the facility would take over 400 trucks off the road, which will significantly ease traffic on Apapa road. The Minister of Power, Works and Housing, Babatunde Fashola, had on August 5, 2016, inspected the damaged bridge. After a meeting with relevant stakeholders on August 7, he ordered the immediate closure of the bridge. Julius Berger moved to site the following day to begin emergency repair works. But after an impact assessment of the bridge, it advised the Federal Government to embark on its closure for comprehensive repairs.